We want every child to achieve their full potential and we know that parents share this goal. There is a clear link between good attendance and educational achievement. If your child is not in school, on time, as often as possible they will be missing out on many important parts of their education. 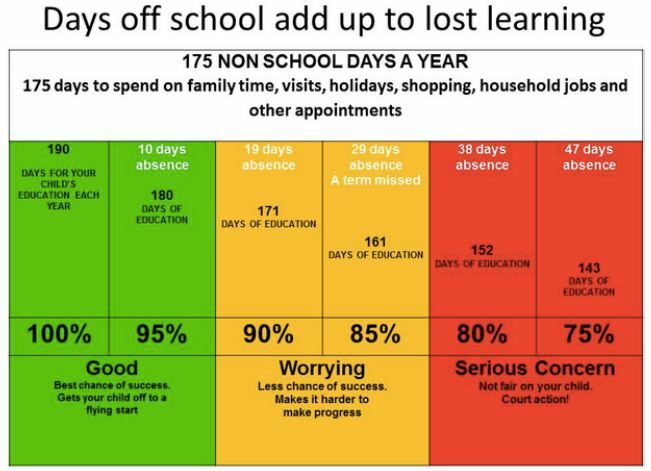 We monitor attendance closely and contact parents to inform them and offer support where attendance has dropped and causes concern. Good attendance is promoted in school through assemblies and rewards. We are always happy to work with families to support and improve attendance. Family emergencies need careful consideration. It is not always in the best interests of the pupil to miss school for family emergencies that are being dealt with by adult family members. School and school friendships and relationships can provide pupils with stability and care during difficult times. The routine of school can provide a safe and familiar background to life during times of upheaval.